Here in San Diego the big thing to do on a Tuesday night, is to go out and stuff your face with some of the best darn lobster and/or fish tacos you can find. Drown them with a few cervezas like Tecate or Corona and call it a night. Even though it’s fun to splurge, the recipe below is a healthy twist on a taco night that is simple, super easy and a delicious alternative. 3 large carrots I use a potato peeler and create thin strips of carrots for this dish. 2 radishes thinly sliced – again i just used my potato peeler to get really thin slices. Mix all three ingredients and Sauté your pork or Tofu, red peppers and mushrooms in this sauce until finished. The best part the Dipping Sauce: Simply mix all ingredients together and set aside for dipping! Voila! You’ve just finished making a delicious dinner. This shouldn’t take more than a half hour to throw together and have on the table. 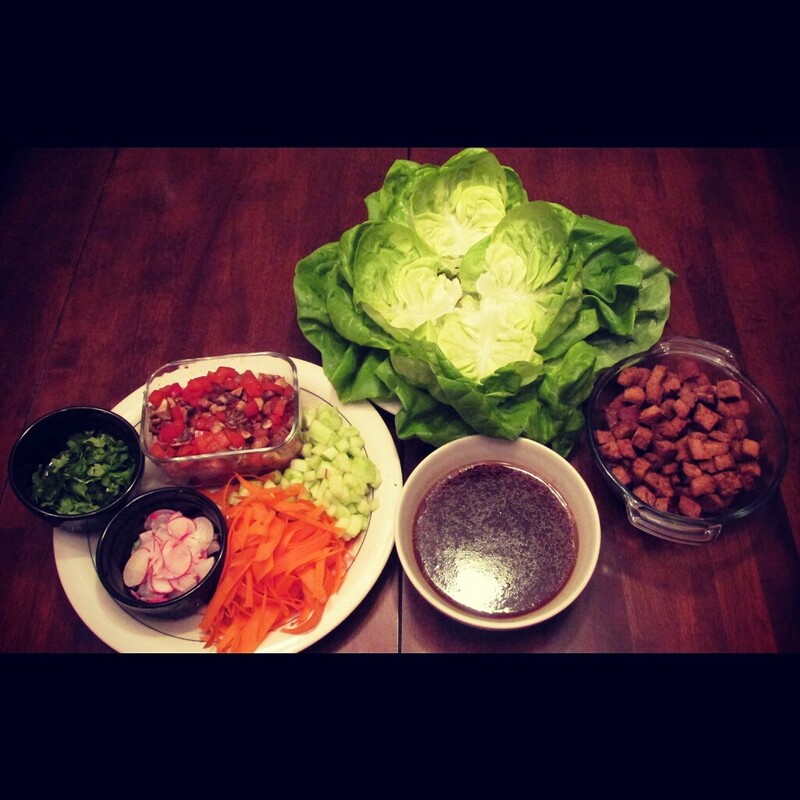 This makes about 12 small lettuce wraps which feeds 3 people. Keep in mind you can make this gluten-free by simply cutting out the ketchup and using tomato paste and using gluten-free soy sauce. Happy Healthy Eating!!! Food makes me happy. Fake food and chemicals being added to my food do not make me happy. I have a growing concern about two major things. 1. The quality of food. 2. Our choice of consumption of food as a nation. With this being said I can understand how an American lifestyle influences fast, easy and cheap to be the three magnet factors to food choice however I think we need to go back to the basics and remember just how easy it is to make good food, good for you without breaking the bank or spending hours sweating away in the kitchen. This entry was posted in ALL Recipes, Appetizers, Dinner Recipes, Lunch Recipes, Salads, Vegan Meal, Vegetarian Meals and tagged Dinner Recipes, eat fresh, Gluten Free, Healthy, healthy taco, lettuce wraps, potato peeler, Salad, simple meals, taco tuesday, vegan, vegetarian meals. Bookmark the permalink.